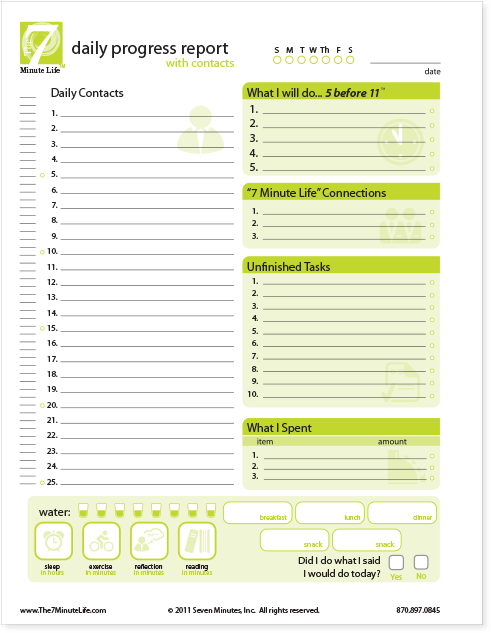 I was recently given an opportunity to review a daily planner, The 7 Minute Life Daily Planner. I'm pretty sure my response when asked about my interest in the product went something like this: I've tried planners in the past, even written my own, but have just never been able to stick with them for more than a few days (yes, days). However, as crazy busy as my life is with raising kids, maintaining a home, home schooling, running a business, and being involved in my kids activities, I really could benefit from this product ... if I can just figure out how to stick with it. In reality, it's not that I just don't stick with it, it's that I've never found a planner that fit into my life any better than what I was already doing. I find that changing my system screws up my system more than it helps. I've been told I don't adapt to change well ... maybe so. But I do so want to be more organized, to focus on what's really important (um, not Words with Friends) and get those necessary things done in a timely manner. I'm not adverse to organizers and planners, I'm a huge list person so I do understand the value of writing down what needs to be done, and I know it helps immensely, it's just that whole adapting to change thing. The 7 Minute Life is a time management and productivity company. 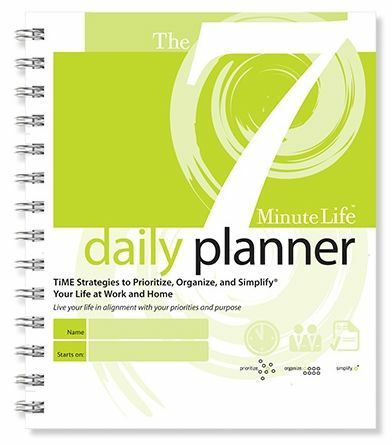 In addition to webinars, other products, and speaking opportunities, they offer The Seven Minute Life Daily Planner, which I received to review. The premise of the planner is that it will help the user simplify their life, stick to priorities, beat procrastination, declutter the mind and life, stop feeling overwhelmed, and get rid of stress, all in 7 minutes a day. The planner is a time management tool, not a typical date book. First of all, the planner is not downloadable, it's an honest to goodness book. You know this makes me happy. The pretty softcover spiral-bound book came arrived via snail mail. Two options are available - pre-dated or undated, and I opted for undated so I could begin at my beginning, rather than being unable to use a few pages that might be printed before my first day of use. The book measures 7.5" by 8.5", is just under 1" thick, and includes 90 days worth of pages. Its pages are pretty and uncluttered, using simple black and two tones of green to print on a white background. It's not huge, this planner can go places - it fits in my school bucket and next to my bed, it could even be carried in a medium to large sized purse or tote. The planner begins with an Introduction which includes opening exercises. I found this introductory section to be invaluable. To begin, the reader is asked to do some work on "Life Ideas", kind of looking at the big picture of who you are and what you need to do over the course of 90 days. The reader is first asked to examine their values, then discover their purpose. I spent a good amount of time on this exercise, doing my best to answer from my heart, and I found the end results to be very eye-opening. I've got a pretty strong idea of what my purpose is, but what I really took away from the exercise was the things I spend time on that have nothing to do with my purpose and are things that I need to stop giving my time and emotional energy to. 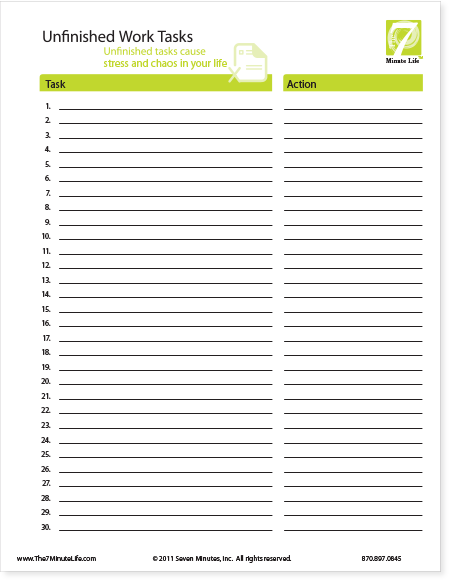 From that exercise the book moves on to a series of ten "Micro Actions", tiny changes and activities to implement on a day to day basis, all to be examined before using the daily planner. Micro Actions include listing unfinished tasks, creating a home repair list, developing a list of annual projects and tasks (things that need to be done once a year), and a meeting planner. Going through these sections ahead of time is key to using the system successfully, as these micro actions create guides to use on a day-to-day basis. The planner then moves on to an annual calendar (to be filled in by the user), annual projects and tasks, 90 days overview pages, monthly calendar at a glance, and, finally, the Daily Progress Report, the daily journal pages of the planner. One of the key items on the Daily Progress Report is the "5 before 11" section, a list of five items to be completed before 11 am. Just five things ... not so overwhelming when it's put like that. I really appreciated this section and found it to be the most useful of the planner, writing those five "must do" items down and specifying a time limit to complete them really bumps them up on the priority list and they get done. Things that landed on my "5 before 11" list were quite varied, everything from "complete and ship orders" to "write this weeks school schedule" to "do laundry". At the end of the day the user is to fill in the box asking, "Did I do what I said I would do today?" In other words, "Did I meet my goal?" I found the planner to be geared largely toward business people. Many of the sections, such as Daily Contacts, didn't apply to me as I work from home through the Internet and do not spend much time on the phone or making new contacts, it just isn't the nature of my business. That said, the sections can be reworded to reworked to meet personal needs. If you take a look at the other TOS Reviews you'll see how other users personalized their planners. So ... did I use it and stick with it? Not exactly. I have to honestly say that even after reading and rereading and working the introductory section I didn't fully grasp the 7 minute concept. I am using the "5 before 11" section. And I am incorporating the information I gained from the Life Ideas and Micro Actions into my To Do list. I set some 90 day goals that I fully intend to meet. However, I have to admit, reluctantly, that I have struggled to use the majority of the Daily Progress Report on a regular basis. Even so, what I did gain from the planner was well worth it to me and I have learned some solid organization, time management, and simplification skills I'll use moving forward. The 7 Minute Life Daily Planner is written for busy adults (that'd be all of us) and is available from The 7 Minute Life for $24.95.